Ministers responsible for Forestry of the Coordination Mechanism for Cooperation in Forestry Between China and the Central and Eastern European Countries (the Coordination Mechanism) have launched the specialized website of the Coordination Mechanism for Cooperation in Forestry Between China and the CEE Countries www.china-ceecforestry.org . The China-CEECforestry website will serve as an information and database backbone of the activities of the Coordination Mechanism, a part of the overarching 16+1 initiative between China and Central and Eastern European Countries. The website operates in English and Chinese language. The website is a tool to connect and coordinate activities in the forestry sectors of all 16+1 countries and especially their science and education community on one side and business community on the other. It represents the forestry sectors in general and lists the relevant stakeholders in each country with the aim of boosting cooperation and information sharing among the stakeholders. The website has been in development for over a year following the decision by the ministers in may 2016 at the first High level meeting of the Coordination Mechanism to create and continuously develop the web site to serve the goals of the Coordination Mechanism. The website will gradually become The focal point of the forestry science and education activities that will offer information on the research and education projects, calls for potential partners, publish investment and other cooperation opportunities among forestry and wood-processing businesses. The page is designed to serve as the main information exchange portal of the 16+1 forestry stakeholders and interested parties and is designed in a flexible manner to allow for future design changes according to the needs of the 16+1 forestry cooperation stakeholders. Currently it gives an insight into the 16+1 cooperation in general and specifically about 16+1 forestry cooperation, of the forestry sectors of 16 countries, provides links to the relevant stakeholders, liaison officers of each country, the secretariat, key forestry institutions in each country and other important and relevant links and information. It offers a tool to list and / or search for partners in business and research and education field and offers the possibilities to publish calls for projects and inform the relevant stakeholders about the status of each project. 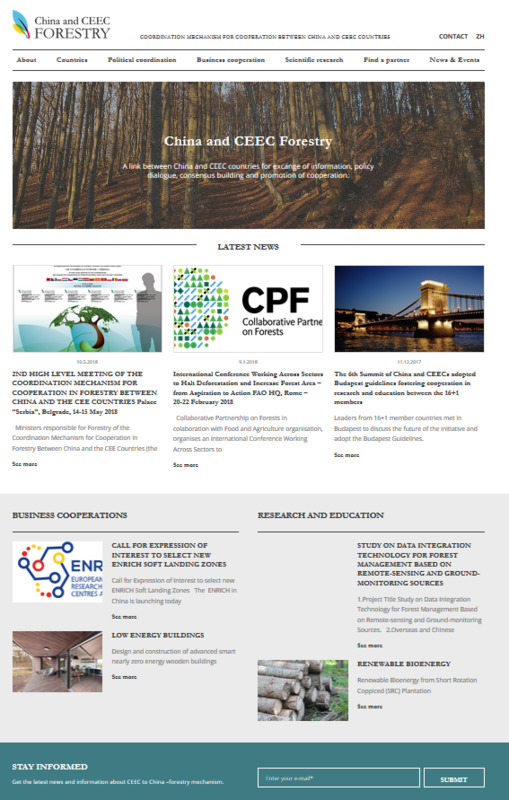 It also promotes, follows and report on events relevant to the 16+1 forestry cooperation. The site will evolve to become useful tool or entry point for any kind of joint projects, business ventures or any other activity concerning 16+1. It is designed as web platform for the 16+1 forestry cooperation to get access to the partners and partner institutions in relevant field.